Six British Airways aircraft to have new Club World by the end of 2019. Yes, dear reader, you read that correctly; at the end of 2019, British Airways will have a grand total of six aircraft fitted with their new Club World business class product. However let me rewind. 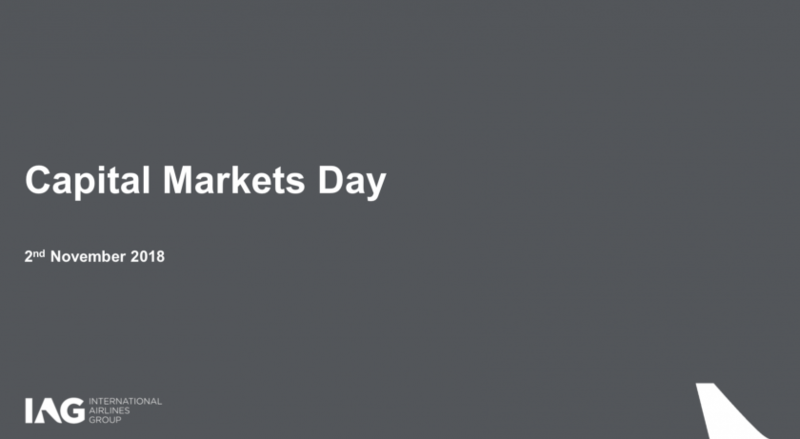 Yesterday, IAG, the parent company of British Airways held their Capital Markets Day – their annual presentation aimed at investors. They have a detailed call and PowerPoint slides to go through it. For those that want to review the deck, all 174 slides are located here. British Airways have announced that their new Club World product will be fitted on their A350-1000 aircraft, which are due to arrive from the summer of 2019. The slide below has a number of interesting tidbits on it. It confirms that by the end of 2019 a grand total of six aircraft will be flying with the new seat, out of a total longhaul fleet of over 100 aircraft. It appears that First class will not see any major changes, with perhaps some improvements to the catering? Wi-Fi will finally arrive across the majority of the short-haul and long-haul fleet. For economy travellers, they will continue to cram more seats into the same amount of space as previously. I suspect that means the 777 fleet will continue to go from 3-3-3 to 3-4-3 as the Gatwick aircraft have. The next slide has some further interesting nuggets. 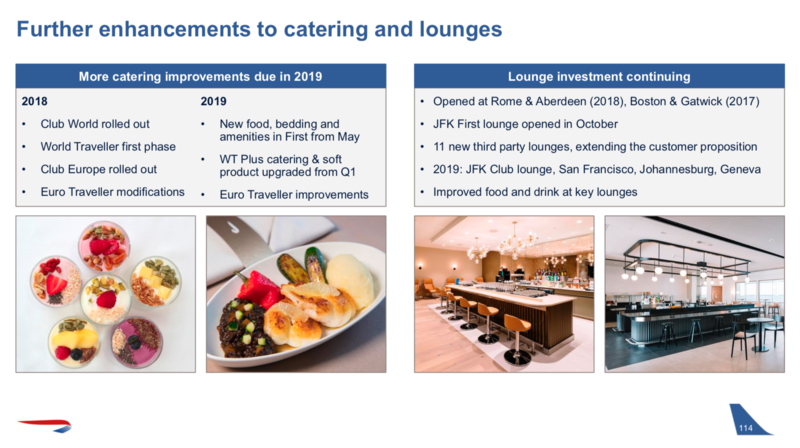 There apparently will be “Euro Traveller improvements” to catering next year. Given that the current complimentary offer is a glass of water, on request only, that wouldn’t be too hard. 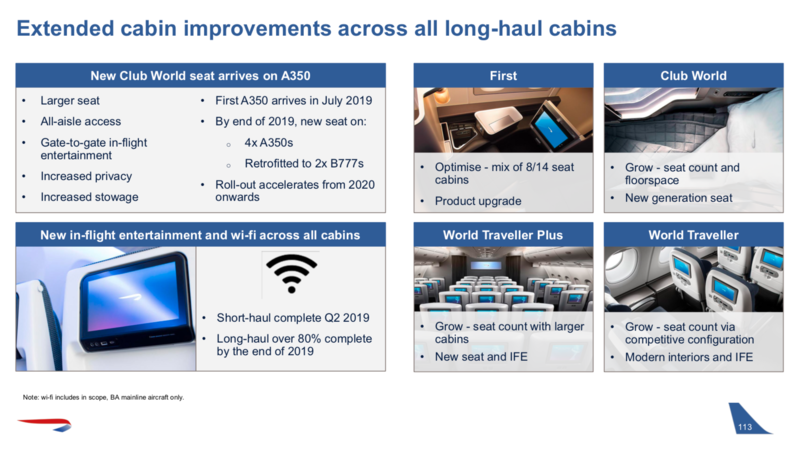 They confirm that First class will see improvements from May, which would seem to be a little before the new Club product flies for the first time with the A350-1000 aircraft. Slide 115 has an interesting comment in “Increased flexibility for top tier customers”. As a seven year Gold Guest List passenger, again, British Airways couldn’t get more inflexible if they tried. 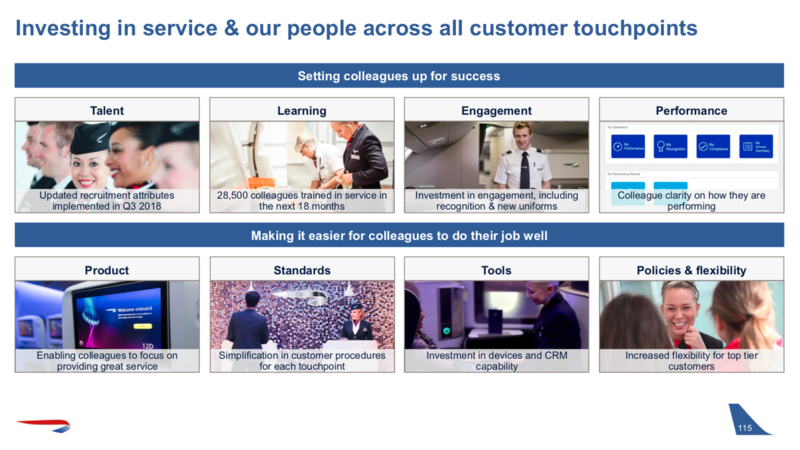 So unless there are real and meaningful changes such as the call centre being able to rebook passengers on any other airline during times of disruption then this is something to be taken with a pinch of salt. Slide 116 illustrates the paucity of ambition that exists within Waterside when it comes to technology investment. Tweaks to the app and chatbots are hardly cutting edge and if they have to call out the fact that they are testing the ability for customers to charge their mobile devices in the lounge then one wonders what’s actually going on there. 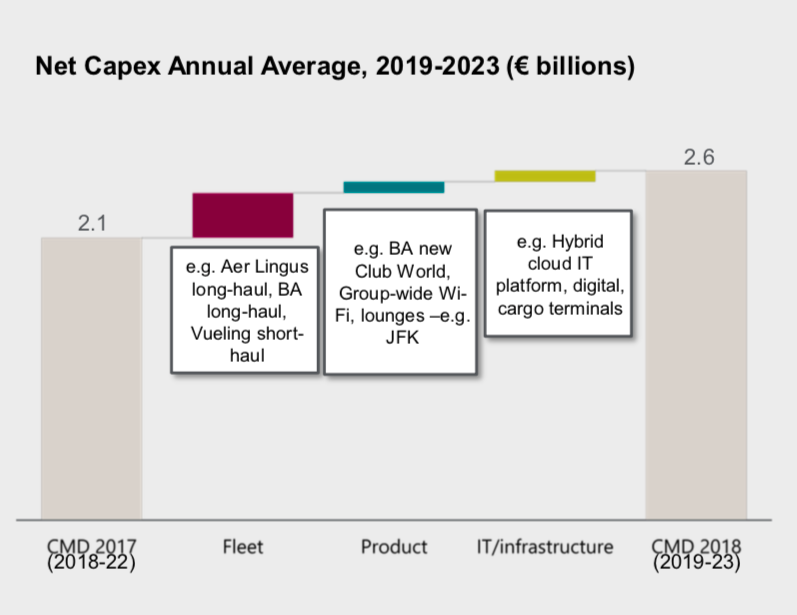 Slide 171 has this interesting chart which shows the proportion of capex increases devoted to some of the new British Airways investments. Given the delta between the two looks to be €0.5bn, it appears that the red box is roughly €300m, with the green and yellow only €100m each. That means for new seat, and Wi-Fi on aircraft, and all the lounge improvements, British Airways have only a further €100m to spend added to their budget since last year. That’s not a lot. Perhaps I’m being overly harsh here however their strategy of continuing to cut the product and service, whilst raking in the cash seems to continue unabated. There’s no significant shift in strategy, no significant investment in product or customer experience here and no real digital innovation. 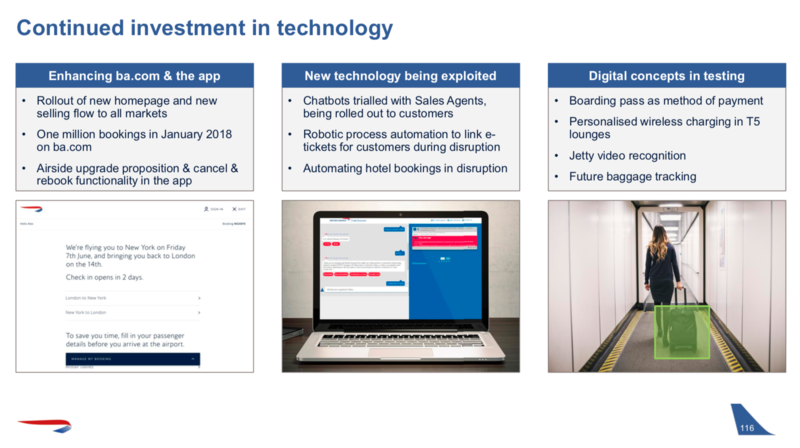 Whilst the deck is aimed at investors, rather than customers, it appears to be very much business as usual for British Airways. I’m not sure that a shiny new all aisle access Club World seat, on six aircraft in over 12 months from now, can fix things. Previous Post: Challenge. US West Coast in less than three weeks’ time. Next Post: Qatar Airways to leave oneworld?